The artwork was produced with Sundog Multiples—a printmaking enterprise operating as a joint venture between the Department of Art & Design and UND Art Collections, with generous funding provided by The Myers Foundations. 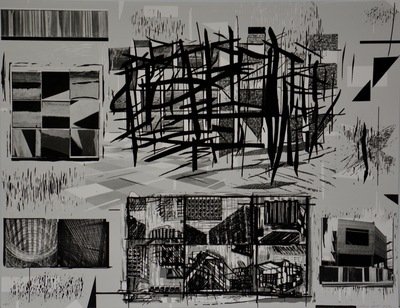 The original print exhibited in the area surrounding the Scale-Up Classroom was created in conjunction with UND’s 2012 Arts & Culture Conference: Binary Inventions, Art & Culture in the Digital Age. The print relates to a campus-wide plan called the “Living Art Museum.” The concept behind this plan stresses the idea of “relevancy” in regard to what is selected for display—as it relates to the concerns of people who are normally present in spaces where the art is placed. With this concept in mind, the artwork relates to the issue of recent digital technologies that are available to “scale up” processes utilized in contemporary printmaking.